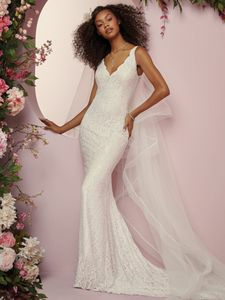 Description: Comprised of soft allover lace, this sheath boho wedding dress features chic straps and a V-neckline. V-back is accented with illusion and lace motifs. Lined with Inessa Jersey for an elegant fit. Finished with covered buttons over zipper closure. Tulle veil accented in lace and edged with horsehair sold separately.